Dinner was indeed a grilled affair. 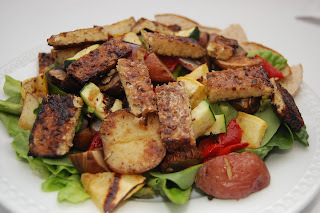 We made a Grilled Tempeh and Veggie Salad. We marinated the tempeh in balsamic and port wine vinegars. Grilled up asparagus, zucchini, yellow squash, portobellos, red onions, red and green bell peppers, and new potatoes. Piled it all on top of lettuce and spinach and drizzled with a balsamic vinaigrette. The weather was supposed to have been sunny today, but it ended up starting off very overcast. While I would have preferred another bright, sunny day, I suppose that the clouds kept the temps down for the run. Now, about that run. I had told Jason that I wanted to do a longer run. For me, that's usually 4.5 - 5 miles. I know, not really all that long in the grand scheme of running. But, for me, that's long. I didn't want to put any pressure on myself and say a set mileage. The deal was that we'd just run and take it as it went. Today I logged my longest run ever at 6.2 miles. While it wasn't the fastest by any means (just under 54 minutes), it wasn't too shabby. Jason really did well pacing me down (I tend to just take off full speed ahead) so that I could do the longer run. For me it's not about the cardio, it's about my hip flexors and outer hips starting to hurt around mile 4. I don't know if this is a conditioning issue that I can overcome, or if it's something more physiological. So Kelly @ Healthy Living with Kelly - I held up my promise to run for you. Not 10 miles granted LOL. We brought along a picnic lunch to eat (devour) after the run. I had made plenty of hummus and Carrot & Cabbage Salad so I just made wraps again and brought along some apples as well. It was a nice finish to a good run. After our run, we made a stop by Home Depot for some plants. We got some new hedges to put in front of the porch. I also picked up some red and yellow bell peppers and other plants for all of the containers I have in the back yard. Do you enjoy working in the yard? Dinner tonight was a take on my Whole-Wheat Rotini with Creamy Lemon Sauce. 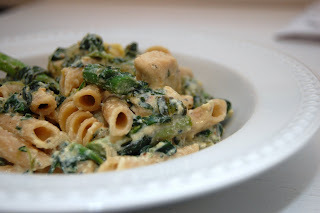 Tonight I used whole-wheat penne and included asparagus in the pasta for a . In large non-stick skillet, saute onions and garlic in small amount of olive oil until soft and translucent. Add in artichoke hearts. Cook pasta according to package. Drain, but reserve some cooking liquid. Meanwhile, in a food processor, blend the remaining ingredients except for nutritional yeast and reserving half of the zest until smooth. 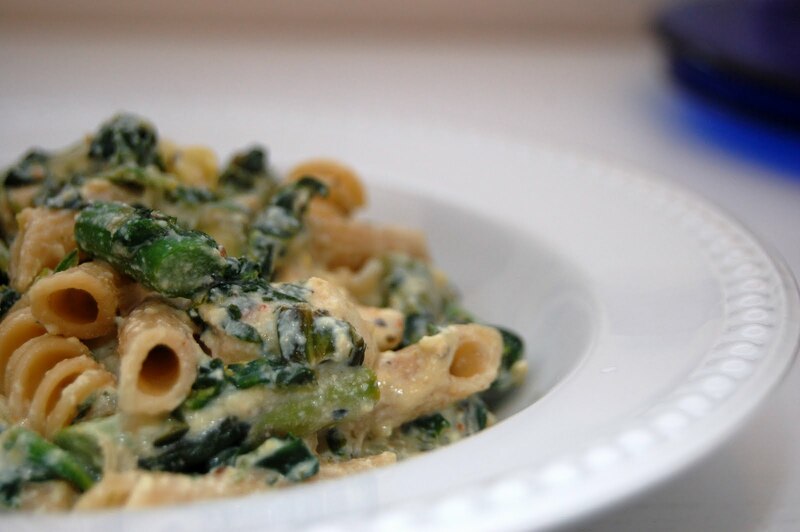 Use pasta water, white wine, and/or soy milk to thin sauce if needed. Combine pasta, sauce, spinach, into skillet with the onions and garlic. Add the nutritional yeast and re-season if needed. Let simmer on low until sauce is heated. Top with remaining zest and additional parsley and serve. I will say that using the soft silken tofu actually works better for this. I only had the extra-firm though and it was really quite thick. I had to use wine to thin it out (darn). 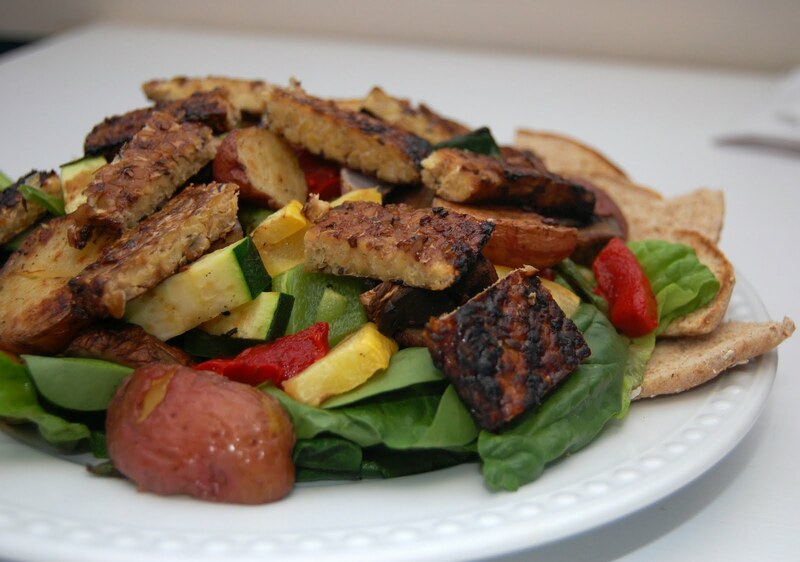 The grilled tempeh sounds awesome! I love how you used all the vinegars. Happy Easter! Happy Easter to you too Jenna @ Healthy. Happy. Well ! I have found that tempeh needs to have a really wet marinade - or for me anyway. Otherwise it can be really dry. yum that looks delish, as usual! congrats on the run!! Jolene @ To Be Determined Thank you ma'am! Hey, hey-- GREAT job on the run!! And both of those dinners look absolutely delicious! Great job on completing your longest run! That is impressive. What a great way to spend a Sunday. Good for you. I haven't run that far in quite a while. Both your dinners look great. Your salad is particularly calling my name. I enjoy gardening, but it doesn't always work out for me like I want it too. I need to learn to not be so invested in the outcome and just enjoy the experience. The lemon pasta looks divine! Glad you made it for 6! That is great. I haven't been running in so long, I don't even think I can make it for 3 miles. haha. Congrats, that's awesome! I had a goal this year to run 10 miles.. so far I think 3 is as far as I've made it.. at least it's only April, there's hope! congrats on your run! It may be a training issue with your hip flexors. I don't know. I so want to try tempeh! I can't get it anywhere over here. Your salad seemed really good! Anna @ Newlywed, Newly Veg Thank you ma'am! Hope you had a great weekend by the way. Thanks Tina @ Tina Bit of Faith Fitness and Fun I was fairly proud of myself I must say. Alicia @ Vegan Epicurean I figured you'd like the salad. I've gotten pretty good at growing certain veggies so I stick with those! Kristen @ The Swanky Dietitian The pasta really was good. Love using tofu as a "cream" sauce base. Alyson @ Nourished Fitness Yep, you still have plenty of time to hit that goal of 10 miles. Not sure how much over 6 I plan to go!! Hey Nicole @ Geek Turned Athlete I may try to do some reading about my hips and hip flexors. I've always had probs with my right hip flexor after an overuse injury in dance. There is a lady in Germany who is on a forum check in I do on Cathe's site and she said the same thing about not being able to find the tempeh. Her husband is in the military as well. Maybe the next time you're in the states you can make it a point to try it out? amazing dinner and Congrats on that amaznig run! i did a 10k and that was my longest run to date toO! it was exactly 6.2 miles!! well done, girl! so happy and proud of you! Your pasta looks delicious! :) Also ... seeing the word "grilled" so much up there makes me so happy it's grilling season again! I've never tried grilling tempeh, I need to get on that! Great job on your run! I'm also guilty of taking off like a bullet when I run and then getting worn out before I've gone the distance. the pasta recipe looks/sounds fantastic. i love asparagus so much right now! good job on the run! Naomi @ One Fit Foodie Yes, we did the 6.2 miles to make it a 10k actually. Not that I'm training or anything. Thanks you much for your kind words! Lesley @ Lesley Lifting Life yep, it's definitely grilling season! Love this time of year. Katie @ Up Fit Creek Glad I'm not the only one to get a little ahead of myself at the starts of a run. I just have to constantly remind myself to pace myself. Janetha @ Meals and Moves I love asparagus too and it's one of those veggies I sort of forget about too. And way to go on your run. I think that's awesome! Way to push yourself. Candice @ ChiaSeedMe it sounded like you had a good day too!